A Memorial Service will be held at 11:00 a.m., Saturday, March 2, 2019 at St. John’s United Church of Christ in Bluffton. The family will receive friends one hour prior to the service and following the service at the church. Burial will take place at a later date in Thompson Cemetery. 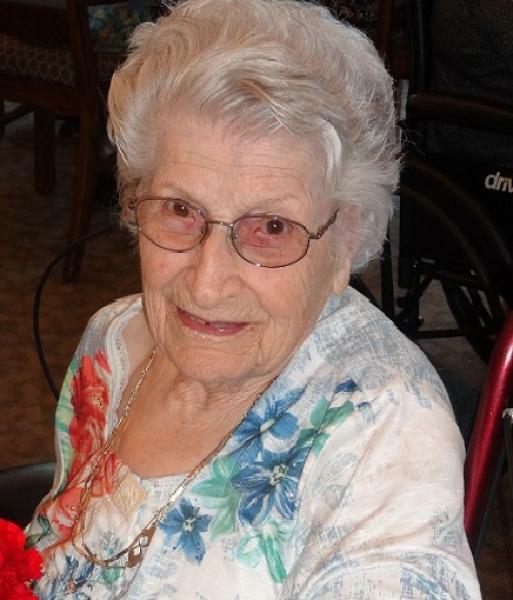 Frances Delta Scoles, 105, passed away peacefully of natural causes on December 3, 2018 at Mennonite Memorial Home in Bluffton. 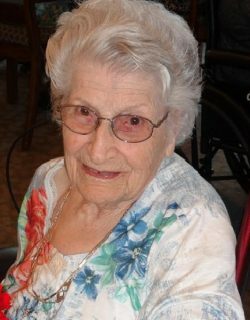 Frances was born August 12, 1913 in Bluffton to the late Alfred and Adele (Grant) Criblez. On December 6, 1936 she married Guy Scoles who preceded her in death in August of 1982. Frances graduated from Bluffton High School and attended Bluffton College. She was a homemaker and was a lifetime member of St. John’s United Church of Christ in Bluffton where she was active in the Women’s Groups and was a Sunday School teacher. Frances volunteered many hours at Bluffton Hospital, helped with 4-H Clubs, Cory-Rawson School Booster Clubs and the Parent-Teacher Association. She enjoyed vegetable and flower gardening and the Ohio State Buckeyes, Cincinnati Reds and the Pittsburgh Steelers. Survivors include a daughter, Denise Scoles of Keizer, Oregon; three sons, David (Celia) Scoles of Salem, Oregon, Roger Scoles of Bluffton, Frederick (Lynn) Scoles of Oswego, New York; a daughter in law, Lois Jean Scoles of Knoxville, Tennessee; nine grandchildren; four great grandchildren; and a sister, Rachel Crow of Findlay. Frances was preceded in death by a son, Franklin Scoles; seven sisters, Blanche Wilkins, Pauline Bosse, Lucille Taylor, Freda Neiswander, Elvena Heldman, Ellen Griffith, Harriette Luginbuhl; and five brothers, Louis, Charlie, Theodore “Ted”, Maurice “Dock” and Robert. Memorial contributions may be made to St. John’s United Church of Christ or the Bluffton Hospital Auxiliary.